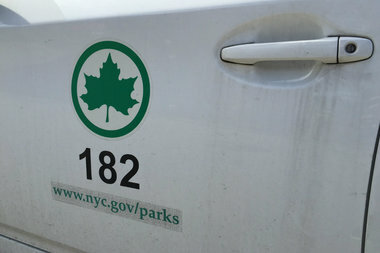 A thief stole $7,000 worth of tools from a Parks Department Truck at Randall's Island, police said. EAST HARLEM — A thief on Randall’s Island stole $7,000 worth of tools from a Parks Department truck, police said. The smash and grab job happened in a fenced-off parking lot near 600 East 125th St. at roughly 6 a.m. on April 6, according to the NYPD. When the 45-year-old driver returned to the lot he noticed broken glass near the Parks Department vehicle. Someone had broken the back passenger side window and taken the tools inside, police said. The stolen items include a $2,500 camera, a $2,000 box wrench set and a $1,000 tank. Other items are screwdrivers, flashlights, saws and wrenches, police said. The Parks Department did not respond to questions about the robbery. ► A man who had been in the hospital for nearly five months found his 32-inch TV and bottle of cologne missing from his apartment when he returned home. The 64-year-old victim had been at Harlem Hospital from the end of November to April 8, police said. They did not disclose why he was at the hospital. He did not find any signs of forced entry into his apartment. A manager told the victim that maintenance workers and other staff have access to his apartment, according to the NYPD. ► Two men were arrested from taking a pair of Beats by Dr. Dre headphones from someone’s head. Henry Folwer and Phillip Patterson were walking near 124th Street and Lexington Avenue about 8 p.m. on April 9 when they spotted a man wearing a pair of the popular head phones, police said. Folwer, 19, grabbed the headphones and passed them along to Patterson, 29. The two of them took off running before police caught them a few hours later, according to the criminal complaint. Both were charged with grand larceny and criminal possession of stolen property, records show. They are at Rikers Island on a $1,000 bond. Their next court date is Wednesday. Neither of their lawyers were immediately available to comment.